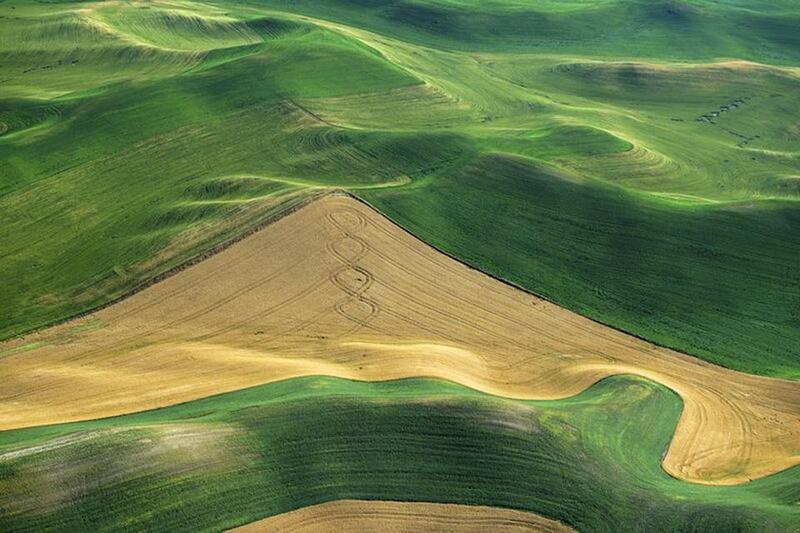 Neal Rantoul’s “Near Pullman, WA.” part of his “Wheat, Washington, 2009-2012” series at Danforth Art. The arrival of photography created a new way of seeing. The arrival of aerial photography created a new way of using that new way of seeing. Photographing from above offers a form of visual liberation. Its practitioners slip not only the surly bonds of Earth but the perhaps even surlier bonds of perspective and familiarity. A few photographers, such as William Garnett and Alex MacLean, have specialized in aerial photography. Others, like Terry Evans or Bradford Washburn, have dabbled in it. 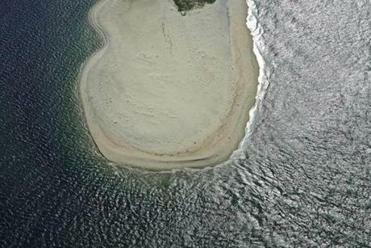 Rantoul shot his Cape and Islands pictures from a thousand feet up. They have a winning simplicity and clarity; they’re pristine without looking antiseptic or artificial. The occasional building or road (or tennis court!) seems like an anomaly. Even in this tame, inviting environment, man is distinctly an alien presence. A few images, like a photograph of Naushon, can be read almost cartographically. Most of them present a different sort of visual reality: They verge on abstraction. Aaron Siskind’s “Volcano 103” at Danforth Art. Sebastian Smee’s picks in Boston-area art museums. This Cape is a place that’s human, all too human. Kaplan presents people, people’s artifacts, and people’s artifacts in unexpected places. We see beached boats, birdcages, flotation devices, a cabin on a trailer, a snowed-on Corvette next to a stack of kindling, a really big pile of discarded TVs in a motel parking lot. One Kaplan photograph shows a scoop of ice cream, seen from above, spilled in a parking lot. Through the power of association, it looks like one of Rantoul’s aerial landscapes — though not one of his Washington state ones. Rantoul first visited eastern Washington in 1993. After returning in 1996, he’s photographed there nearly every year since. The 16 large photographs at Danforth Art make it easy to see why. They have a cool, beneficent beauty. The effect is slightly unreal, even otherworldly. The only orienting elements are color, most often dun and verdigris, and shape, almost always curved. The patterning within the wheat fields, equally owing to cultivation and contour, can make the landscapes seem like earth art. Neal Rantoul’s “Naushon, Elizabeth Islands,” from his series of Cape and Islands photographs. Morell’s “The Island of Rota” has plant life in common with Rantoul’s wheat pictures, and that’s about it. Morell is best known for his work with a camera obscura, and these pictures are also the product of a very old technique: cliché-verre (literally, glass picture). Here Morell has taken leaves and other bits of plants, traced them on a glass plate, and reproduced the images photographically. With their rich variety of textures and interplay of light and dark, they’re like Rorschach blots for botanists. Morell compares their appearance to that of “imaginary dense jungles or forests.” If Rantoul’s wheat fields look otherworldly, these jungles and forests look really otherworldly. 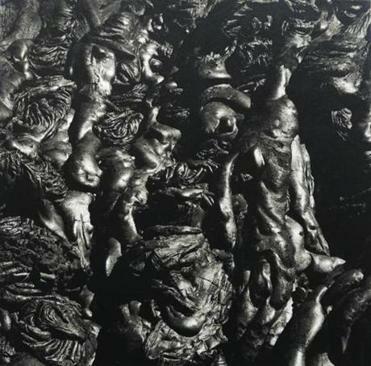 The solidified lava flows that Aaron Siskind photographed in close-up in 1980 as part of his “Volcano” series have a blunt, unyielding density far removed from Morell’s leaves and ferns. There are 10 images at Danforth. They could be reliefs Henry Moore sculpted in obsidian, or fossils of some unimaginable pachydermous creature. 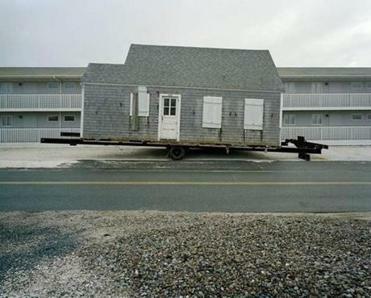 Brian Kaplan’s “248 Shore Road” is an example of him presenting people’s artifacts in unexpected places. “Aaron Siskind: A Selection” runs at Gallery Kayafas through May 11. In no more than a dozen photographs it manages to present a choice overview of his career. An image from Siskind’s justly celebrated 1930s series “Harlem Document” shows his social-documentary roots. Soon enough, he’s verging on abstraction. Throughout there’s his love of texture and surface and a fondness for disorientation. This is a man who never met a horizon line unbegrudgingly. One of the photographs is from the “Volcano” series; another, from Peru, in 1975, could be a forerunner. Robert Richfield, whose “Perpetuidad” also runs at Gallery Kayafas through May 11, worked for several years as Siskind’s assistant and printer. He’s photographed cemeteries in Europe and North and South America. “Perpetuidad” consists of 16 photographs and a photographic combine. They depict Mexican columbarium walls, mausoleums, and grave sites. There is nothing austere or deathly about these images. Garish, exuberant, and a bit overwhelming, they’re almost dementedly colorful. Pauline Kael once compared the palette of Francis Ford Coppola’s “One From the Heart” to melted ice cream. Richfield’s colors look like melted ice cream made on Mars. This takes some getting used to. Once that happens, the warmth and vitality of these images make them seem an absolutely logical response to death in all its dark dull absence. Death be not proud — and life be very (very) loud.